This super smart piano will teach you how to play—like an effective, patient teacher. 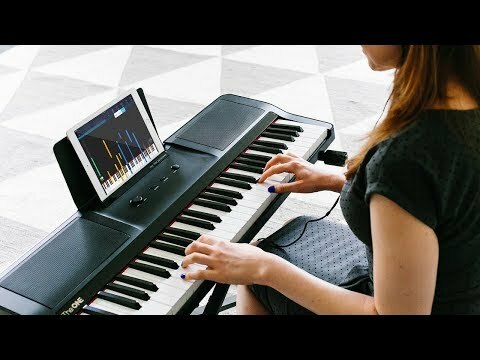 Sync your device to the piano and your hands to the keys, where LED lights integrate seamlessly with the screen and guide you with step-by-step and hand-by-hand instructions. Pick from the library of videos and digital sheet music as you make your way from Twinkle Twinkle to one of Mozart’s concertos. You can stop, rewind, and slow down whenever you want. And when you’re not practicing, use your piano as a speaker to stream music. Built-in mp3 speakers for third-party streaming of apps such as Spotify, YouTube, Pandora, etc. Dimensions: 54" x 26" x 18"
This isn’t just a smart piano, it’s also a patient, effective teacher. Sync it up to your smart devices. LED light-up keys integrate seamlessly with an on-screen keyboard to give you step-by-step and hand-by-hand instructions. There’s a library of videos and digital sheet music to choose from. You might kick off this new vocation by learning the crowd-pleasing, very-practical “Happy Birthday” and then transition into more complex favorites. Like any understanding teacher, The One Piano will match your pace. Unsure of what note is being played? Touch the screen to play the sound and watch the corresponding key light up. Feel like the class is moving too quickly? Pause, rewind, or slow down at any point in the lesson. You can learn to play on a keyboard or a more traditional-looking piano. And, when you’re not honing your piano skills, you can stream music on The One Piano and use it as a speaker. The connected experience is intuitive and easy to understand, whether you’re a kid or grownup. Practice makes perfect—and this piano makes the practice part super inviting.